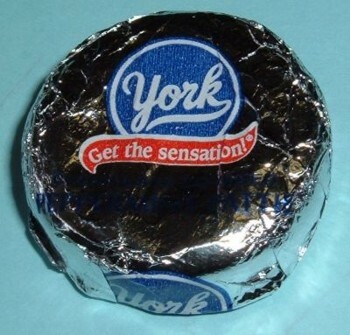 When I bite into a York Peppermint Pattie, I get the sensation of driving a team of sled dogs through the Alaskan wilderness in the Iditarod. Do you remember those commercials? I bought a Hershey York Peppermint Pattie a few weeks ago and was immediately accosted by my family: “Can I have a piece?” “When can we eat that?” What!? This bit of chocolate bliss has a diameter of about 2.5″ and you want us to split it four ways? Alas, when you’re part of a Candy Addict family, you have to share. The Peppermint Pattie, as you may know, is a disc of peppermint-flavored sugar covered in a thin layer of chocolate. When I finally got to eat my fourth of the Peppermint Pattie in peace, the strong peppermint flavor filled my mouth. It’s a very refreshing flavor, a “zing” if you will. I personally don’t like those hard peppermints that you find in old ladies’ candy bowls, but York has basically perfected soft peppermint. The chocolate actually seemed to get buried in the sugary peppermint, which isn’t a bad thing given that a York Peppermint Pattie is peppermint at its finest. Speaking of the chocolate… in preparing to write this review, I actually read the Peppermint Pattie label for the first time. Did you know that the chocolate coating is dark chocolate? I never knew. York was providing its customers with healthy antioxidants before it became popular. Good for you, York! One more thing I learned is that this tasty peppermint treat is not a York Peppermint Patty. No way. It’s a Pattie through and through. The little girl from Peanuts might be called Peppermint Patty, but she’s not chocolate covered, filled with sugar or deliciously refreshing. Winter is coming, and you may or may not hit the snow-covered slopes this year. Whether you’re in front of a roaring fire at the ski lodge or in front of your computer browsing Candy Addict, a York Peppermint Pattie can carry you away. Where will your sensation take you? Of all the minty candies with chocolate, this is the acme of perfection. And when I was little I was convinced my mother did too. So I’d buy them with my allowance.. maybe it was me subconsciously knowing that she didn’t like them so I could eat them all my own, and still look like a good child? These are classics. I am not much into the chocolate-mint combination in general but really like these ones. Peppermint Patties are wonderful, zesty, zingy things. It’s been my candy of choice lately. I am not a big fan of mint/mint-related candies, but this one would have to be my favorite of the bunch. Sometimes I wish they would do a peppermint crunch patty variation for Christmas. @ Robby – A Peppermint Crunch Pattie? Interesting thought. I wonder how that would be. I love crunchy candies, so on one hand it sounds good…but at the same time, I don’t know.. it’d be worth trying though. Let’s suggest it to them! I use to live in York Pa. I lived just around the corner from the Factory where they made York Pepperment Patties. I loved waking up of the mornings with the wonderful smell in the air. An stopped by daily for the broken pieces they would sell by the ziplock back full… oh those were the days.. I dont know about the senations but I sure gained a few pounds. Of course this was back in the 80′s when they were still made in York Pa.